Eight persons B, J, K, M, S, T, V and W are living on a eight storey building in such a way that the ground floor is numbered one, the above one is numbered two and so on till the topmost floor is numbered eight. They all are teachers of the different subjects viz., Physics, Chemistry, Maths, Civics, Economics, Botany, Zoology and Computer but not necessary in the same order. 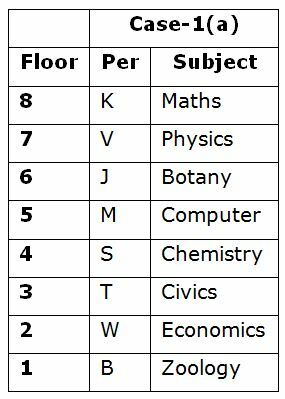 Only one person living is living between the one who is a Botany teacher and S, who lives on the fourth floor. Three persons are living between V and the one who is a Civics, who lives below V. The one who is a Civics teacher lives on the odd numbered floor. Only one person lives between V and the one who is a Computer teacher. The Computer teacher lives immediately below J. B lives immediately below the one who is a Economics teacher. As many persons living above the one who is a Physics teacher is same as the persons living below the one who is a Economics teacher. B is neither Botany teacher nor Chemistry teacher. Two persons are living between M and the one who is a Maths teacher. Only one person lives between W and the one who is a Chemistry teacher. T does not like Maths. 1. B is a teacher of which of the following subject? 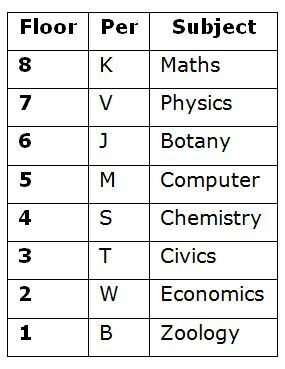 Only one person living is living between the one who is a Botany teacher and S, who lives on the fourth floor. Three persons are living between V and the one who is a Civics, who lives below V. The one who is a Civics teacher lives on the odd numbered floor. Only one person lives between V and the one who is a Computer teacher. The Computer teacher lives immediately below J. B lives immediately below the one who is a Economics teacher. As many persons living above the one who is a Physics teacher is same as the persons living below the one who is a Economics teacher. B is neither Botany teacher nor Chemistry teacher. Two persons are living between M and the one who is a Maths teacher. Only one person lives between W and the one who is a Chemistry teacher. 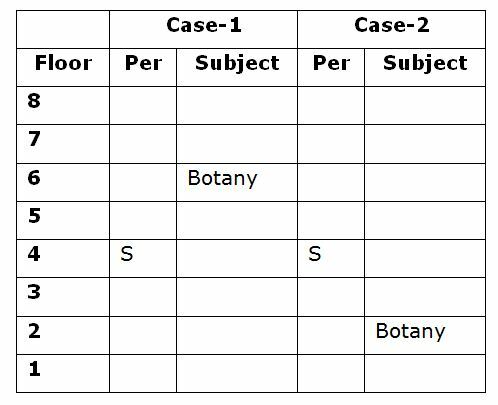 So, Case-1(b) and Case-2(b) will be dropped. T does not like Maths. 2. How many persons are living between J and the one who is an Economics teacher? 4. Who among the following persons lives on the topmost floor? 5. If S is related to Computer and J is related to Physics in a certain way. Then, W is related to which of the following? Direction (6-10): In the following questions, the symbol #, $, @, &, ^ are used with the following meaning as illustrated below. ‘A&B’ means ‘A is neither smaller than nor equal to B’. 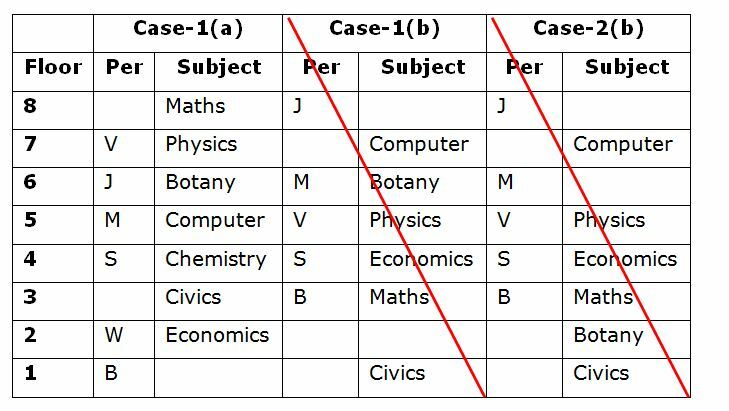 1) B is a teacher of which of the following subject? 2) How many persons are living between J and the one who is an Economics teacher? 4) Who among the following persons lives on the topmost floor? 5) If S is related to Computer and J is related to Physics in a certain way. Then, W is related to which of the following?